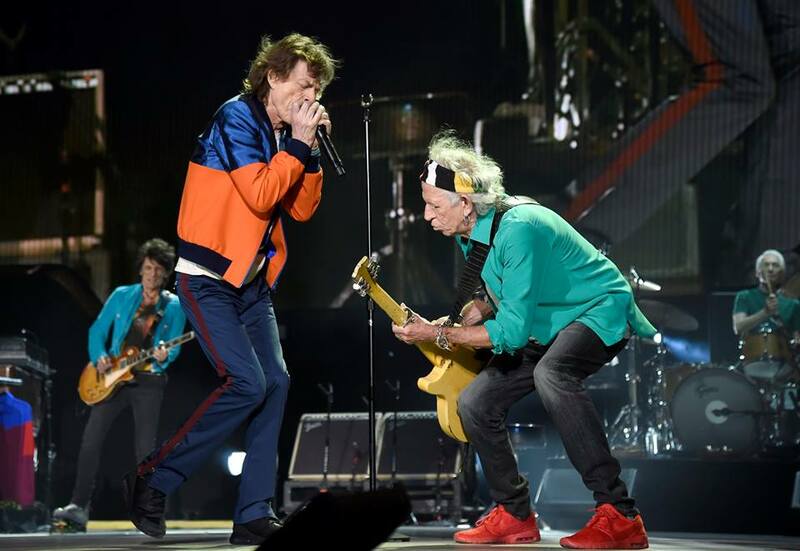 The Rolling Stones wrapped up 2015 by hitting the studio to begin sessions for a new album. January saw the band in rehearsals for their first South American tour in a decade, which kicked off in Santiago, Chile on February 3. The 12-date América Latina Olé tour made headlines when a worker was killed during an apparent heist while transporting funds from drink sales at the venue following a show in Buenos Aires, Argentina on February 10, which forced the band to upgrade their security with a 24-hour armed guard. The same month brought news that former Stones bassist Bill Wyman was undergoing treatment for prostate cancer which, he says, was caught early enough that he expected to make a full recovery. In March, a lost Stones song surfaced 50 years after it was originally recorded when a friend of the sound engineer at the studio checked the contents of a tape that sat in his attic for decades after he saved it from being destroyed. “No One Loves You More Than Me” was recorded in 1964 during one of the group’s first sessions at IBC Studios in London’s Portland Place. On March 25, the Stones made history when they became the first British rock band to perform an open air concert in Cuba. The event was filmed and issued as “Havana Moon” with a September premiere in theaters ahead of its official release in November. The Stones opened their first-ever major touring exhibit, “Exhibitionism”, at London’s prestigious Saatchi Gallery in early April. The event sees the band display items from their 50-year career and features more than 500 important and unseen artifacts from the group’s personal archives. In May, the group announced plans to perform in the fall at the new classic rock festival Desert Trip, a two-weekend event that would also include full sets from Paul McCartney, Roger Waters, Bob Dylan, Neil Young and The Who. The band issued a new live collection, “Totally Stripped”, in June 3; the package expands on the 1995 unplugged album, “Stripped”, which delivered acoustic and alternate versions of the band’s classics alongside select covers of tunes by Bob Dylan and Robert Johnson, among others. On May 30, guitarist Ronnie Wood became a father to twin girls just two days before his 69th birthday; later in the year, 73 year-old bandmate Mick Jagger added a son to his family on December 8 with 29-year-old girlfriend, American ballerina Melanie Hamrick. In September, the Stones premiered the documentary,“Olé Olé Olé! : A Trip Across Latin America”, at the Toronto International Film Festival and released a 15 CD (or 16 LP) box set, “The Rolling Stones In Mono”, featuring a complete collection of their mono recordings from the 1960s. During an early October stop in Las Vegas, the band also performed a surprise, secret show for 1,200 truckers at the Bellagio Hotel as part of a customer appreciation dinner for a truck manufacturer during the 2016 American Trucking Associations’ annual Management Conference & Exhibition. 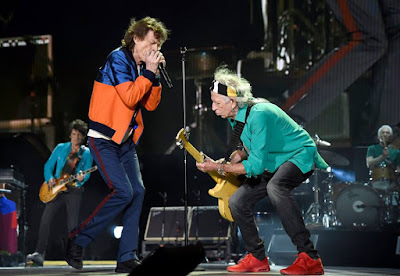 The Vegas appearances were warm-up gigs for Desert Trip, which saw the Stones headline opening night on October 7 before returning for the event’s second weekend on October 14. The group released a collection of blues covers, “Blue & Lonesome”, on December 2. Stemming from the December 2015 studio sessions, the Stones’ first studio album in over a decade featured a pair of guest appearances by Eric Clapton and updated versions of tunes originally recorded by blues legends Willie Dixon, Howlin’ Wolf, Little Walter and Magic Sam, among others. The album topped the charts in the band’s native UK, as well as Australia, while snagging a No. 4 entry on the US Billboard 200. The Stones finished the year by landing in the No. 8 spot on Forbes magazine’s List of Highest Paid Musicians of 2016. According to the annual tallyt, the band earned revenue of $66.5 million from shows on their 2015 Zip Code tour of North America and the Latin American Ole run this past spring.